Throughout our Bali adventure we visited Sanur with kids four times in two months. It’s a really lovely town on the East Coast of Bali. Attracting more Europeans than Australians, the demographic of tourists is quite different. Isn’t it funny? Although it sees plenty of tourists it is far less than other places such as Kuta, Seminyak and Canggu. We stayed in a variety of accommodation options to get the best over view of the town and what it had to offer. We did budget, mid-range and luxury. Oh and we did a personalised family retreat too. It was an awesome experience and very useful for writing this post. Sanur is lined with long stretches of shallow aqua blue waters and sandy beaches. It has a reef a couple of hundred metres from the shore that attracts surfers and paddle boarders alike. Although our kiddos were too young for that, we did get a babysitter and sneak off one morning to hit the waves. We love destinations that cater for everyone in the family. As parents, we easily get wrapped up in what the kids will enjoy the most. Its always good to have a break and do something for ourselves. We loved the high street in Sanur. Filled with boutique shops, healthy food restaurants and plenty of cafes, it was a lovely place to lunch, work and wander. Behind the high street, like many places in Bali, there are lots of little hidden nooks and crannies down windy narrow streets. 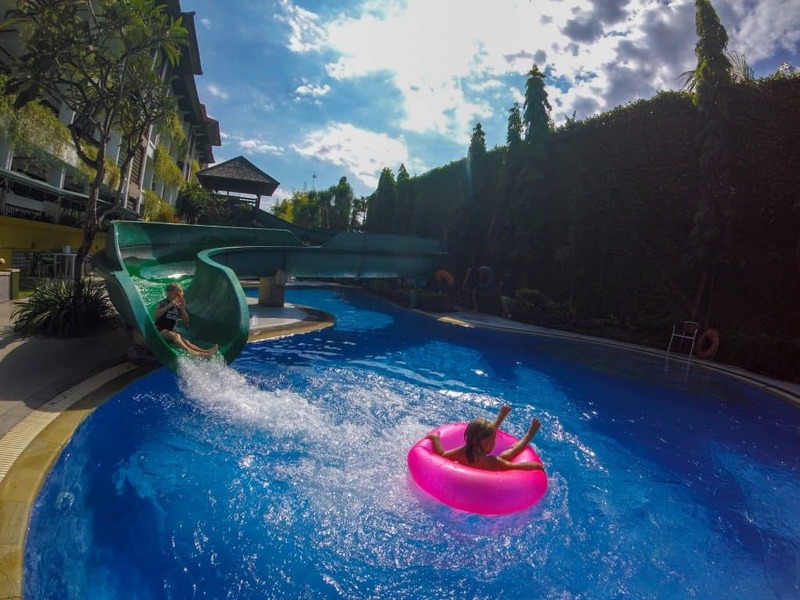 In our usual format of play, sleep and eat, here is a guide to Sanur with kids. 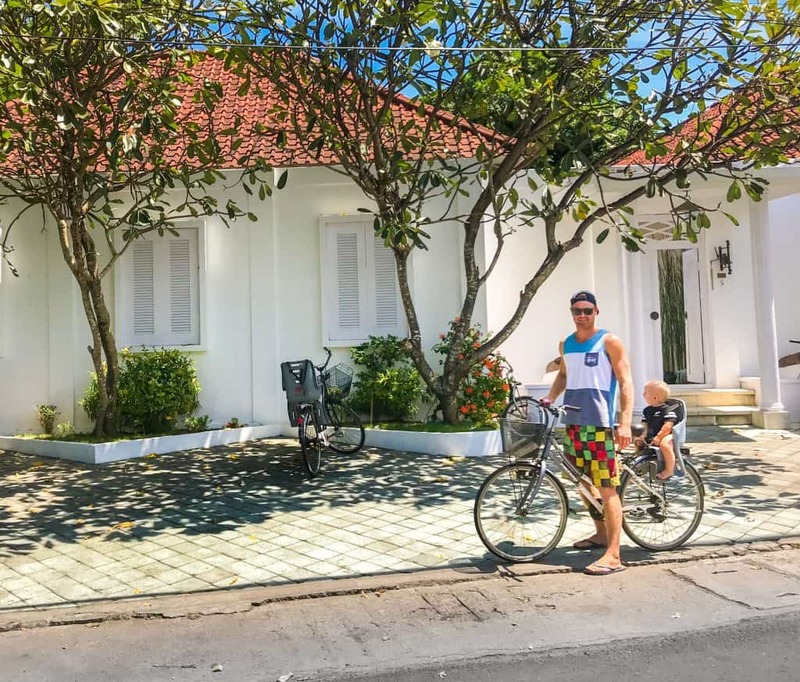 One of our favourite things to do in Sanur was to rent bikes and explore the area. The beachfront has a path that runs all along the edge. We found a bike rental place that had kids seats too. 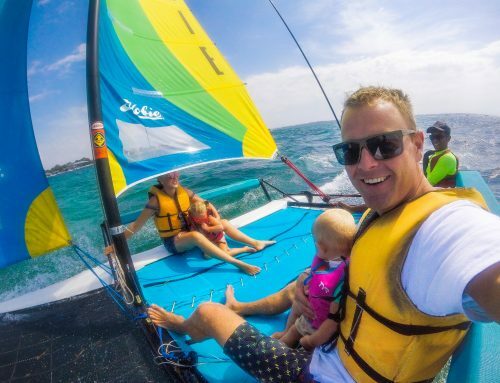 We haven’t found them too often in other parts of Bali so it was great for our little ones and they loved the sea breeze in the mornings. When we went on our family retreat, they had a weekly kids yoga class. The Power of Now Oasis studio invite children from the Jodie O Shea orphanage. The class is open to the public so little ones can attend. It is not a very serious class, its obviously supposed to be more fun than restorative poses and the like! Its always nice to do something that gives back to the local community. 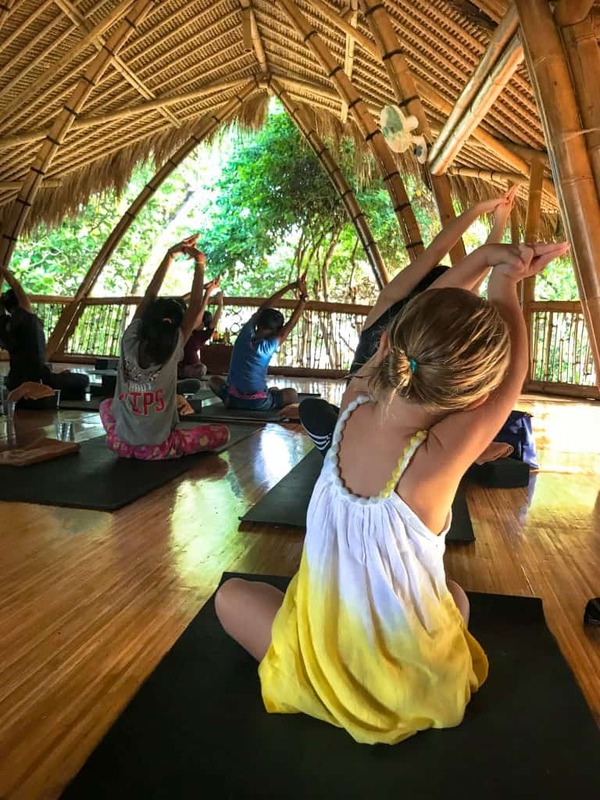 Besides from the kids class, there are plenty of other yoga classes throughout the week for mum or dad. We really loved the studio. The beach in Sanur is really nice and sees a lot less garbage washed up than the West coast of Bali. I’ve heard people describe parts of the beach as a lagoon. The water is warm and its perfect for little ones. The waves are not dumping on the beach like Seminyak. Along the beach there are lots of cafes and restaurants. They have paddle boards, body boards and surf boards for rent. Taking little ones in the shallows on a paddle board is a nice thing to do. We brought our toddlers life jacket. She had a lovely afternoon being paddled around by dad. We stayed in a small room at the Puri Tempo Doeloe. It’s a boutique hotel with several cottages around a swimming pool. It has a very unique design with some beautiful crafts and colourful soft furnishings. The budget rooms were at the back of the hotel, a little away from the main pool. They were basic but also perfectly clean and nice for anyone on a budget. They had a restaurant onsite named La Tartine. The staff were all really adorable and Esme had lots of fun in the pool. It didn’t have anything specific for children. However they certainly have a pretty hotel with a good review score on all the major hotel websites with rooms at a good price. 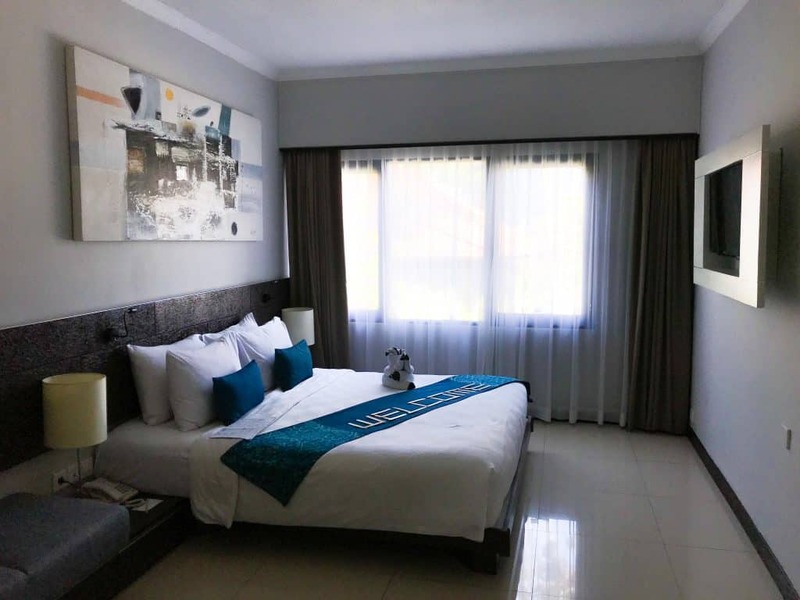 If you ask our children their favourite place in Sanur, they will definitely tell you it was Prime Plaza Suites. We had a two bedroom self-catering apartment within the complex. They 100% have the family at heart. With water slides, special shade over the pool, baby swimming area and a playground. Not to mention a kids club, regular activities throughout the day, nanny service, the list goes on! Both of our children had an absolute blast. They had some lovely restaurants on site. At night the place comes alive with beautiful fairy lights throughout the hotel. it really felt magical and all of the guests were really in the holiday spirit – relaxed and happy! My only teeny criticism of Prime Plaza was the kids activities were slightly competitive. For example colouring competitions, marble finding games and races. 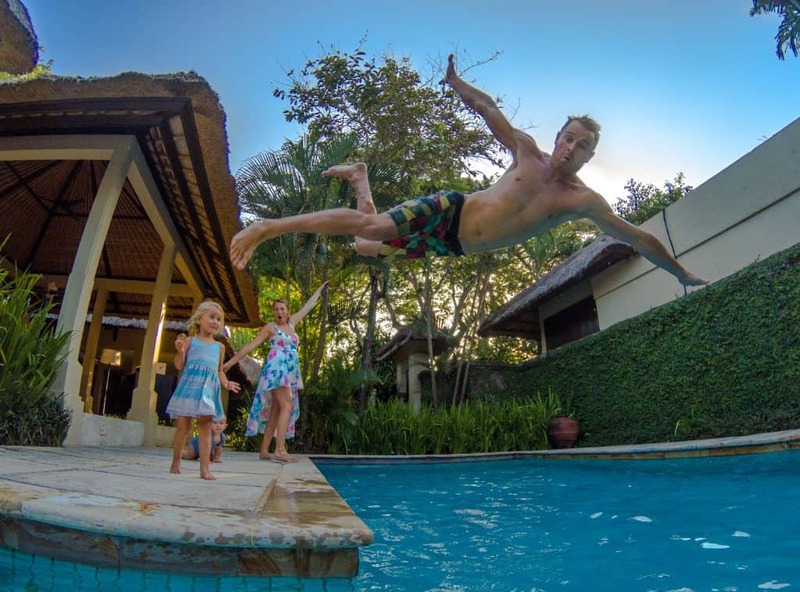 We preferred the activities such as movie time, Balinese dress-up and snorkelling. 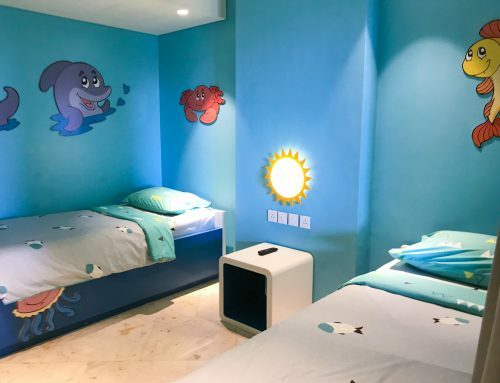 So as we mentioned the kids favourite was Prime Plaza Suites, but as parents we really loved the Kayumanis private villas. It was such a treat and absolutely mind blowing service. The eleven high end villas are tucked away in a private secluded part of Sanur. 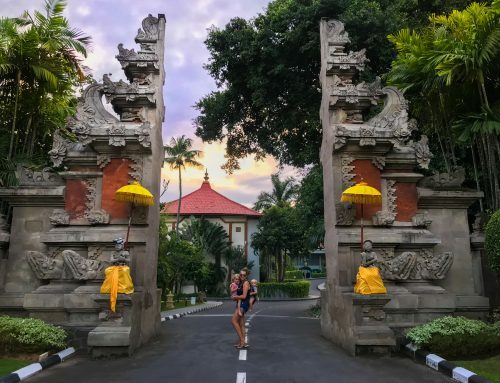 The villas have Balinese culture weaved into every aspect of the design, food and service. We had a private pool, ample outdoor space, including living room, a kitchen and a shaded lounge bed. The outdoor bathrooms were like a manicured garden. With a big bath, a warm shower and luxurious personal products, it was literally heaven! The Genius Cafe was one of my favourite places to eat. 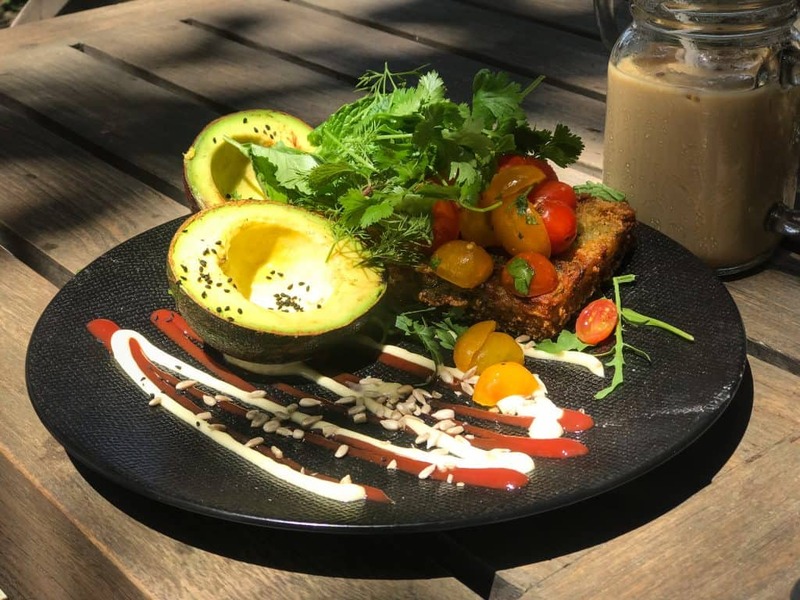 If you read our blogs regularly, you will know I love healthy cafes that serve vegan food, good coffee and smoothie bowls. Genius Cafe has all of that and more. Its on the beach which is a huge bonus. With shaded seating as well as bean bags, it’s a great place for little ones. They have high chairs and even have a little table and chairs for smaller guests. We were impressed with their kids menu. The food was really good, hence returning numerous times. We loved the fact Genius Cafe is also a co-working space. Although we never worked there as such, we loved the idea of escaping with the computer for our working hours. It’s the most chilled place to put the head phones on and get stuck into some work. The view is beautiful and the staff are super friendly. Our friends the adventure travel family introduced us to Neyalan on the other side of Sanur. 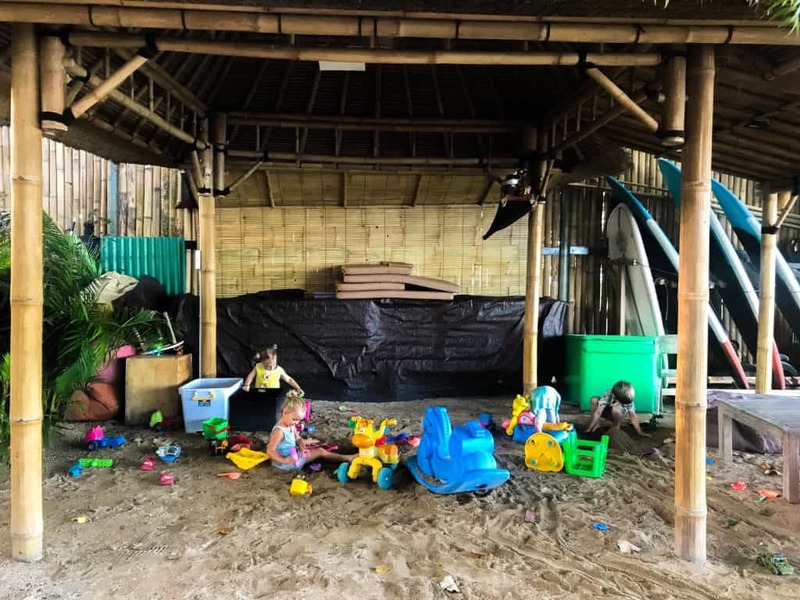 Its also a restaurant on the beach but has the added benefit of having a play space for kids. We met up with our friends to have sunset dinner on the beach and the kids had a blast playing with all of the toys. The food is really good, I loved the tempeh curry. 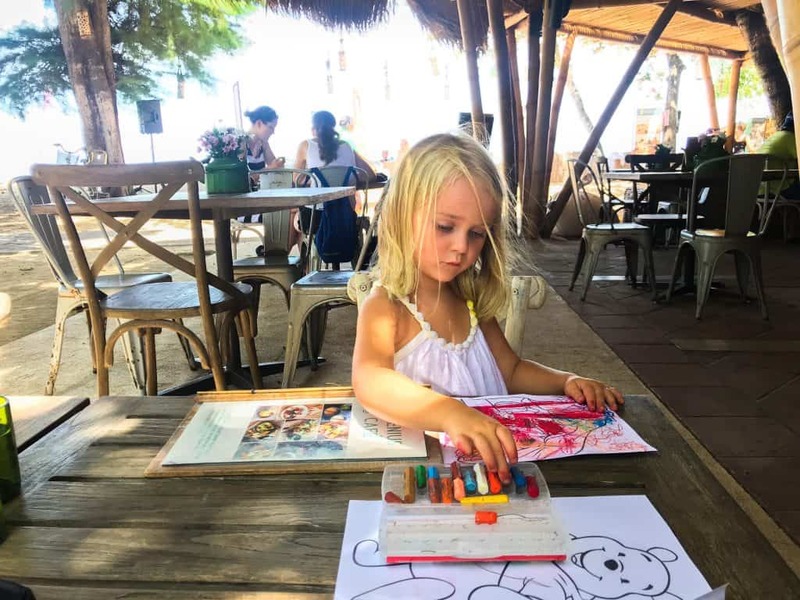 Have you found Sanur with kids helpful? Leave a comment, we would love to hear from you. If we’ve helped you in some way, we would love if you could help us too. In this digital age there is a demand for immediate information online. Being a patron is a new-age way of giving a small token of appreciation for this information, which takes time to put together, with no financial return. We offer exclusive access to blog posts before they are published as a thank you. We also offer travel advice and consultancy at different payment tiers. You can sign up to our Patron program here. 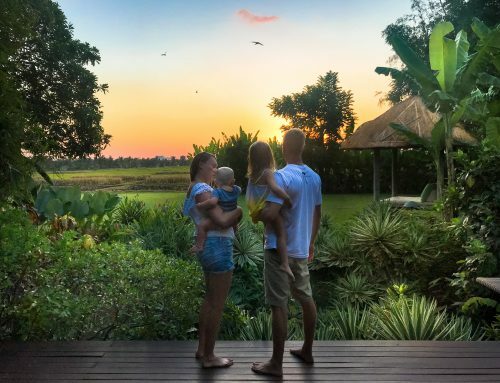 Disclaimer: This post Sanur with kids has affiliate links. Some of our stay was complimentary in return for an honest review. As always all views expressed are entirely my own. Thank you for the information on Sanur! We are heading to Prime Plaza Suites in October with our 3 year old and 1 year old. Me and my 3.5 years are going to Puri Tempo Doeloe in few weeks, can`t wait to get there! Where did you find those bikes with kids seat?